The olive tree first came to Spain with the Phoenicians in about 1050 BC, as they extended their maritime empire to most of the coastal Mediterranean lands. It was cultivated on a small scale in Spain, until the Roman Empire occupied the peninsula and colonized it from 212BC. The Romans developed the olive oil industry to a big business over the next 200 years, exporting vast amounts back to Italy, often taking it as a payment of taxes. Evidence of this lies under Monte Testaccio in Rome, an artificial hill made up of the remains of more than 40 million olive oil amphorae, most of them from Spain. The olive oil from Spain was considered of the very best quality and was in great demand not just for cooking with, but also for oiling the skin and hair, for oil lamps, for religious rituals and for medication. The oldest known cookbook written by Apicius in the first century AD specified olive oil from Hispania in many of his recipes. As the olive oil industry faded in the rest of Europe with the decline of the Roman Empire, in Spain it gained a new lease of life with the Moorish invasion. They brought new cultivars of olive and new methods of cultivation with them, so that today Spain has one of the most diverse ranges of olive varieties in the whole of the Mediterranean. At the end of the Moorish rule in Spain, when Catholic kings were establishing Christianity and trying to root out ‘infidels’, olive oil fell out of favour as the main cooking fat in all but southern Spain. In a time of Catholic fundamentalism using lard in cooking was considered proof of faith, as pork was not eaten by Jews or Moors. Lard became the staple cooking fat of a large part of the country and still is today in some parts. However the cultivation of the olives continued unabated, with farms being handed down the generations and great-great grandsons still enjoying the fruits of trees planted hundreds of years before. Franco’s dictatorship caused a huge faltering in the olive industry when they used propaganda to extol the virtues of soya oil as a modern alternative, encouraging farmers to rip out ancient olive groves to plant soy and later sunflower instead. After Franco’s death olive oil production began to recover once more, and Spain gradually regained recognition for the quality of her oil, much of which is once more exported to Italy where demand exceeds supply just as in the days of the Ancient Romans. Improved production techniques and the D.O. 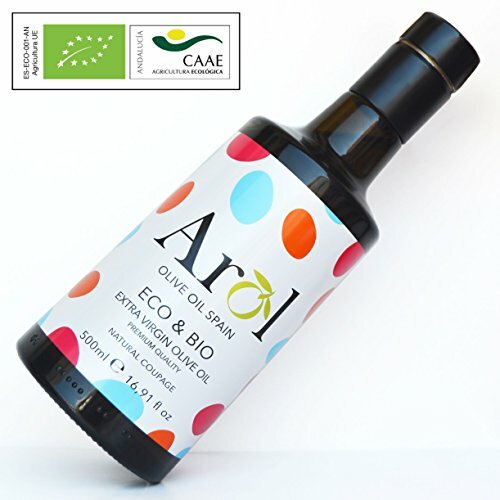 system (Denominacion de Origen) controlling the olive oil industry has led to growing appreciation of top quality Spanish olive oil and the diversity of its aromas and flavours in the rest of the world today.